Living on a wheelchair could be difficult. No one will ever be able to get used to the challenges that we experience every day even though we have been stuck on a wheelchair since childhood. Although we might experience this daily, it will still hurt the same. Have you imagined the challenges which people on wheelchair experience? Infrastructures which do not consider individuals on wheelchairs pose a hazard to us. For instance, because of small doors in buildings, wheelchair users would not be able to enter the building. Another hazard is stairs- how can we get up the stairs with our wheelchairs on? The wheelchair user would need to either ask help from other people to climb up the stairs, get out of the wheelchair and use our hands to climb or do not climb the stairs at all. This is the reason why states have to strengthen the establishment of laws and rules which require buildings to be wheelchair-friendly. These rules should be enforced to buildings which all individuals, wheelchair bound or not, frequently and habitually go to like hospitals and malls. Another problem among the wheelchair users is the transportation. Without the services of a wheelchair transportation in Sacramento CA, it might be difficult and inconvenient for us to travel from one place to another. Any available public transit on land- taxi, bus, or train- does not have wheelchair-friendly doors or entrance. Other than the fact that passengers need to jump or climb up the board whenever we plan to ride on it, most doors are too small to enter to. Private transportation is also a hassle. Unless we have a bigger car at home, we could not conveniently get transported. For ease, convenience and safety while traveling, services of AMERICA WEST MEDICAL TRANSPORT is required. The simple injuries wheelchair users get every day is unimaginable. Since hands are oftentimes used to make the wheelchair move, having dirty hands and blisters on it becomes normal. There may also be instances when the clothes we wear get stuck on the wheels, and this could lead to our apparel being torn and result in getting us naked or exposing our bare skin. The fear of falling from the wheelchair is also a hazard which wheelchair users experience every single day. New and old users feel alike; the fear does not go away. 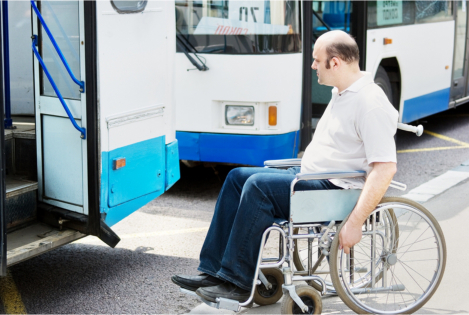 A non-emergency medical transportation in Sacramento CA is therefore helpful whenever a wheelchair user would get out of the house and go to locations which are far from one’s home. Everybody should be informed of these daily challenges of a wheelchair user. Without being informed, we could not empathize with their problems and help them solve it! This entry was posted in Non-Emergency Medical Transportation and tagged Wheelchair, Wheelchair Experience, Wheelchair Transportation. Bookmark the permalink.